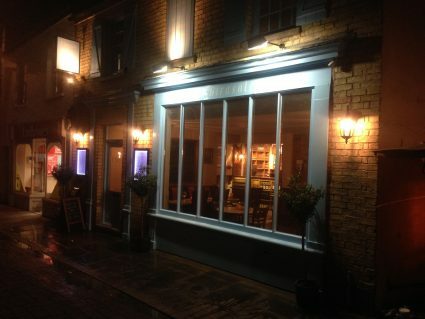 The History of No 13 South Street, St.Neots. The building is Grade 11 listed and described, by English Heritage, as of the Mid-19th Century, with two stories and two windows. The construction is of gault brick under a slated roof and having gauged flat brick arches to recessed sash windows, with glazing bars. The shop front is of wood, with pilasters carrying entablature. It was built as a bakery, in 1846, by a Mr John Way, of Bedford and the first occupier was James Cornelius Shepherd (1811-1846) together with his wife Mary and two children. The 1841 Census for South Street records James’ occupation as a Baker. After his early death in 1846, his widow, Mary, carried on with the business, until her re-marriage to a Mr Tilcock in 1851, when the business and premises were sold to a John Hinde Ekins (1813-1896). Mr Ekins knew nothing of baking and was formerly an employee of Ingersole, the grocers of 28 Market Square. As a side line, he also contracted privately to light and supply oil for the town’s street lamps. On taking on the baking business he employed a journeyman baker for first three months, thereafter doing the work himself and built up a prosperous business. Besides making bread and confectionary he was remembered for his home-cured ham, at 5d per quarter pound, and dinners on market days. On retirement Ekins snr. passed the business to his son John. Sadly the younger John Ekins pre-deceased his father in 1892 when aged just 46. John’s widow, Jessie, then carried on the business for some years. Jessie was succeeded by Ernest Whiting and in 1902, by a Mr. W. V. Hyde, from an established baking family trading from Shefford, Bedfordshire. In the commercial Kelly’s Directories for 1910 and 1914, it is documented that, “Walter Valentine Hyde was a Baker, of 13 South Street, St Neots”. 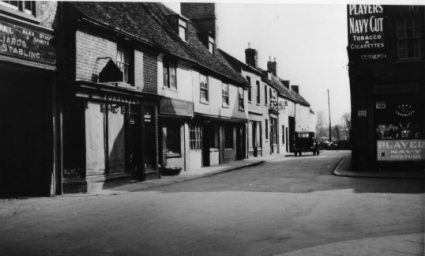 Mr Hyde is later recorded as leaving for Great Gransden, in 1918. 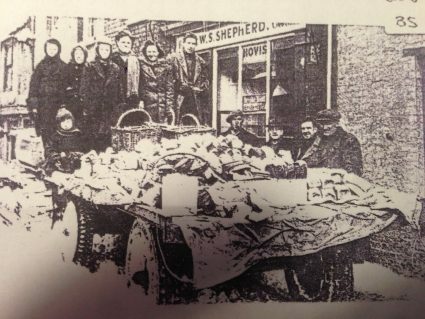 In 1921 the bakery was returned to its original name, Shepherd’s, by its new owner, a Mr W.S. Shepherd, taking advantage of his shared surname with the founder of the original bakery, the non-related James Cornelius Shepherd. When Mr W.S. Shepherd became the owner, he only had a horse and cart, and a hand cart included in the take-over. Willia m Shepherd was well known in the bakery world and over the years the bakery gained gold, silver and bronze medals and silver cups at many national exhibitions as well as numerous certificates. These included three National Championship prizes for Hovis. One award was for a commercial oven, valued then at £168. 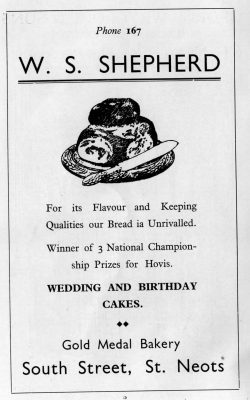 The oven was used for many years in the bakery and the prizes and awards featured strongly in advertisements for the bakery’s long lasting bread and fancy cakes from the 1930’s to the 1980’s. During World War II the bakery output was in high demand, although restrictions in supplies and rationing requirements inevitably led to loaves of reduced size in standard tins. However, due to inflow of evacuees in the area, together with the demand from many military bases and the Forces’ Canteen situated in the market square, extra rations of fat and sugar were allowed. Many hundreds of standard tinned loaves were supplied to the military bases each day. William Shepherd died in 1941, but left his business to his wife Alice, and son Frederick who continued the family bakery business until recent times. After some 150 years, the business of the premises changed from bakery to a fully seated restaurant for up to 90 diners, initially, in 2000, offering a French orientated theme, trading under the name La Bicyclette. In 2002 it was converted to an Italian restaurant and pizzeria, building up a good reputation as place to eat authentic Italian food. 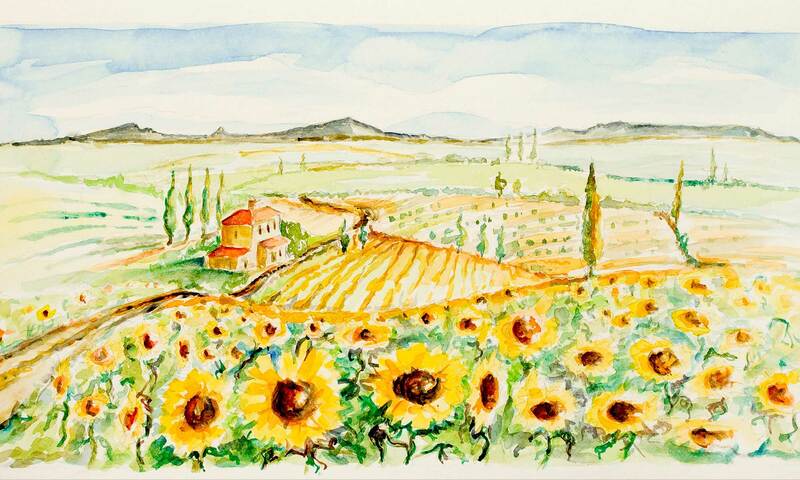 The business changed hands in March 2015 to the current owner, who introduced Italian chefs using authentic ingredients focused on traditional recipes to create a good quality, pleasurable, authentic dining experience.